Juno loves repeating certain words, as much as she loves Muttonbird Bay School. There they let girls wear shorts. But men in suits have come to watch and report. Her school might be the one out of the three in the area that is forced to close. Juno’s teacher tells them there may be a way of saving the school, and that’s by reading more; increasing their literacy level. A reading journal becomes compulsory for all the Class Fives. But Juno simply hates reading. She, is a secret Ninja, loves drawing cartoons, making jokes and climbing. She hasn’t read a book in years! After a few attempts to read books that would bore a door, Juno decides to write her own story and things get interesting. With an imagination without boundaries, and a huge sense of humour, she manages to write a story and read a book that actually holds her attention. Will this contribute to saving Muttonbird Bay School? Kate Gordon has created a cleverly-written beginning to the series with a story within a story, with an intimate look at the character of each cast member. 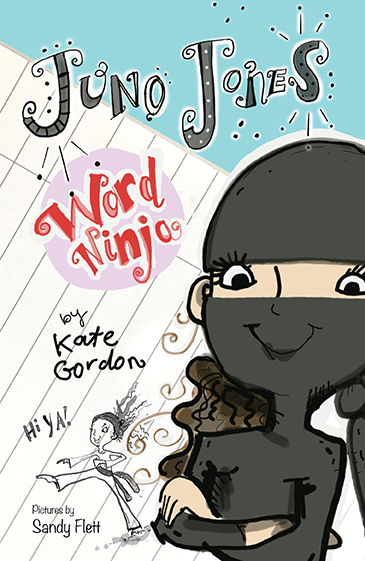 I knew I was going to love this series from the cheeky look in Juno’s eyes on the cover and reinforced by her energetic Ninja kick on the title page. The characters are on display at the start so we know what they look like before the story begins. Juno’s jokes are interspersed through the text and they are actually clever/funny. The series will definitely draw reluctant readers of both genders due to the overall participation of terrific characters, such as Genius George, Juno’s brother, Smelly Bella, the leader of a pack of belles, Perfect Paloma, Shy Vi and their teacher Miss Tippett. Their flippant dialogue and crazy antics will keep readers laughing when not wondering what in the world is going on in Juno’s overactive mind. Kate Gordon and Sandy Flett make a perfect match. They have built fun into every page and anticipation in the reader. I look forward to Number 2.